Mark your calendars! June 2 is a day to DO MORE!!! Do More 24! Please mark your calendars for June 2! JUNE 2: SAVE THE DATE....PLEASE! 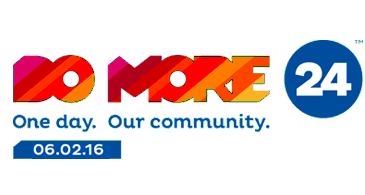 Do More is an annual 24-hour fundraiser that is powered by United Way of the National Capital Area. Last year, RIF of NOVA raised $3,000 with its Do More campaign. Those funds allowed us to fund the purchase of an additional book for every student at two schools. This year we have even bigger plans! With the loss of federal funding, RIF of NOVA has had to cut back to providing only one book per child in many of the schools we serve. Our goal is to provide two books for every child in the 39 schools and centers we serve...not just the two we increased last year. Why is this important? * "Books are essential building blocks of literacy and learning, and two-thirds of our nation’s impoverished children don’t have a single book to call their own." * "...the lack of access to books is a key contributor to the never-ending cycle of educational disadvantage." * "Research has shown that increasing access to books and giving children the choice to choose what they want to read improves academic performance and attitudes toward reading and learning." Help us put more books into the homes and families of deserving children in Northern Virginia by donating during this one 24-hour period: 12:00 a.m. until 11:59:59 p.m. on Thursday, June 2!!! This year, the RIF of NOVA Do More 24 campaign has incentives for YOU! A number of very caring vendors have donated gift cards to allow RIF of NOVA to offer incentives to our supporters! The more you give, the higher the value of the gift card you could win! 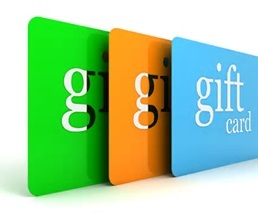 $25 gift card to Presto Valet of Virginia, Inc.
That's 24 gift donations from our special donors! 24 gifts, 24 hours! Do More 24 with MORE! Do you shop online at stores like Macy's, Target, Walmart, Amazon, BJ's, Best Buy, and more? If so, up to 7 percent (yes, SEVEN) of your purchase price may be donated to RIF of NOVA through ShopOnlineAndHelp. What is it? 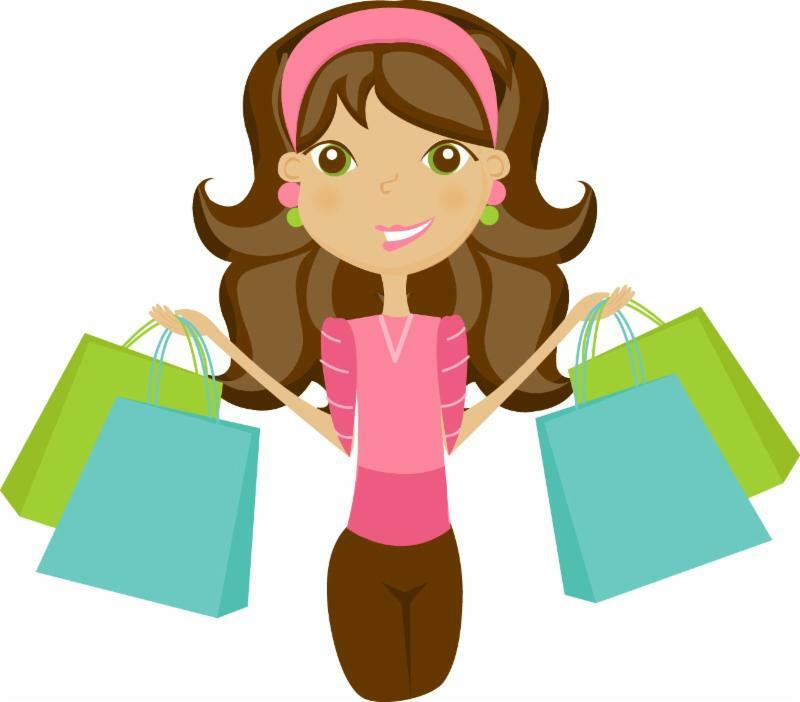 ShopOnlineAndHelp is an online shopping mall where a percentage of any purchase is donated to a non-profit cause. RIF of NOVA is partnering with this online purchase service to benefit our children and purchase new books. Check out our link here and start shopping! What do the Newbery Medal and Bookworm Central have in common? They both focus on children's books that are " distinguished!" The Newbery Medal is awarded annually by the American Library Association for the most distinguished American children's book published the previous year. 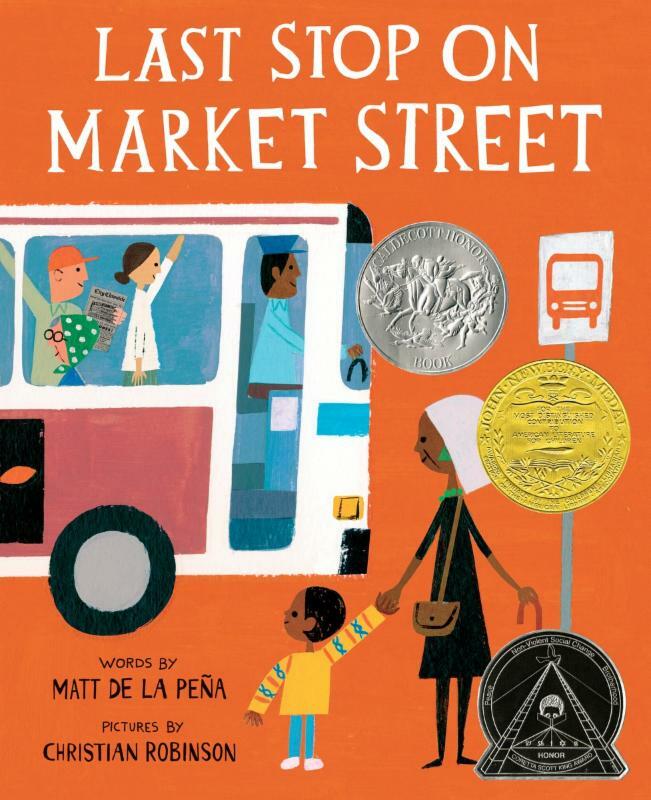 The 2016 winner is Last Stop on Market Street by Matt de la Pena and illustrated by Christian Robinson. Bookworm Central, one of RIF of NOVA's book vendors, offers an array of distinguished books and educational resources that provoke thought, spark imagination, and shape character. 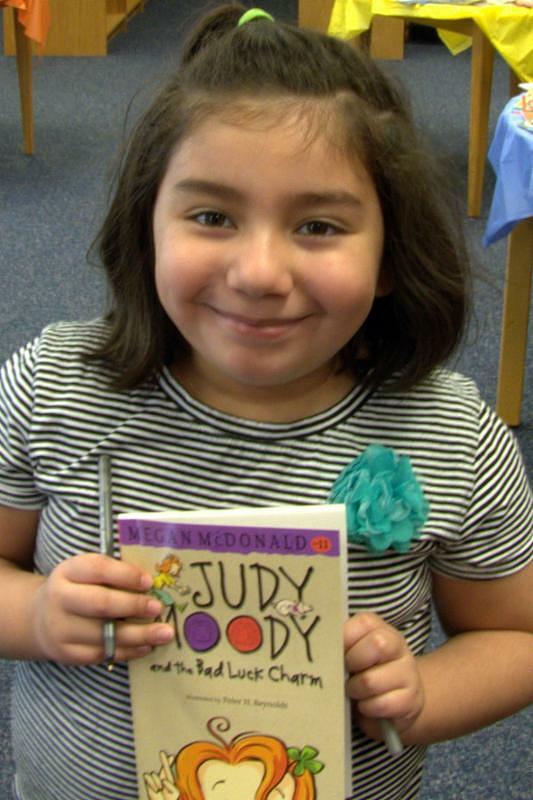 RIF of NOVA is awarding its first-ever "Newbery Inspired Award" to Bookworm Central for "exceptional service and generosity to promote children's literacy." 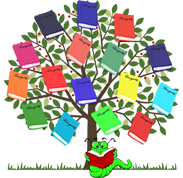 Bookworm Central will provide an in-kind donation of a 25% match to any Northern Virginia RIF order that the book vendor receives. This will allow participating schools to provide additional books to their current RIF populations. According to Laurie Rothenberg, Vice President of Bookworm Central, "We look forward to being able to expand the number of books available to NOVA developing readers." Thank you Bookworm Central for this amazing contribution to promote literacy for RIF of NOVA children! Book distributions in RIF of NOVA schools and centers! 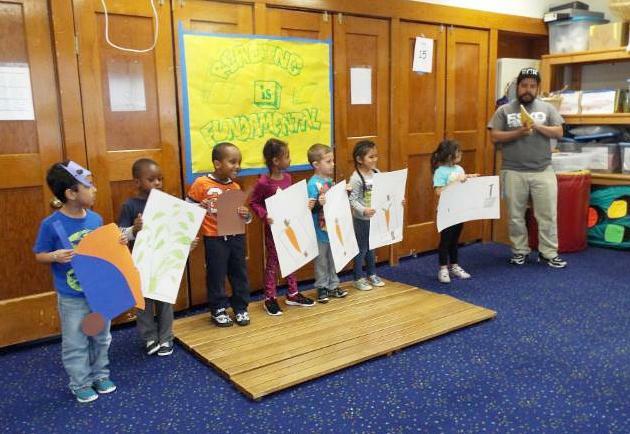 The ACCA Child Development Center's book distribution was called "Our RIF Garden." The children made puppets from two books, The Carrot Seed and The Very Hungry Caterpillar, and then enacted the stories. The movement room became a theater for the young readers and actors. 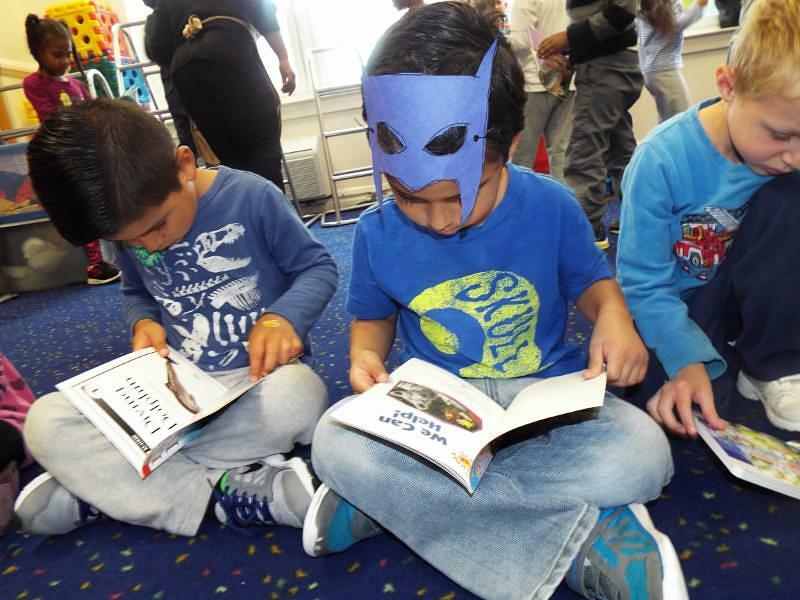 The children at the Annandale center were then able to choose from a large variety of books, and, as you can see, they dove right into reading. According to RIF liaison Jasmeet Kaur, "A wonderful time was had by all!" April was National Poetry Month. 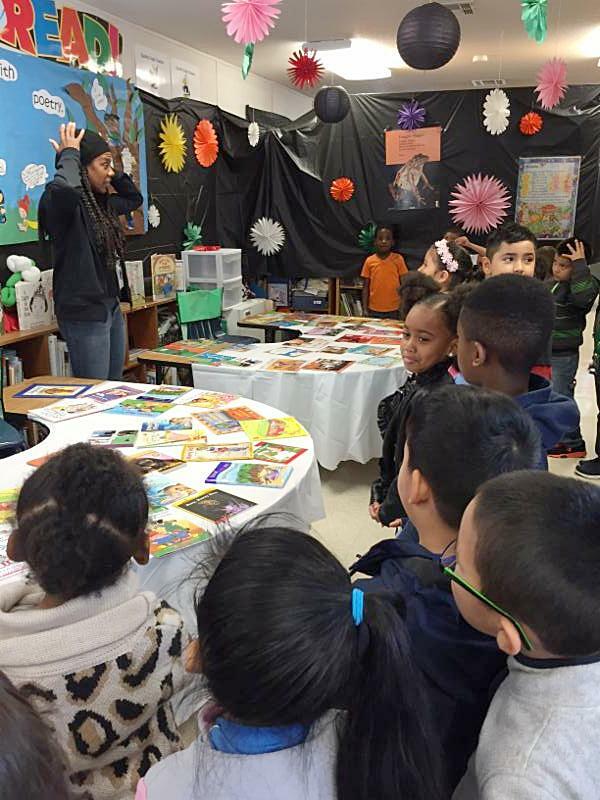 Marumsco Hills Elementary School in Woodbridge celebrated the occasion with a "Poetry Cafe." Students excitedly visited the sixties-style cafe where books, poems, and flowers filled the room. Which book for me? And which one for you? "Welcome to RIF, A Winner Every Time" was the theme for the Mt. Eagle Elementary School book party. Second graders familiar with RIF were so excited, they could hardly wait to tell new students that the RIF books were FREE! Librarian Mary Frances Daly suggested that they might keep them always and even read them to their own children some day. 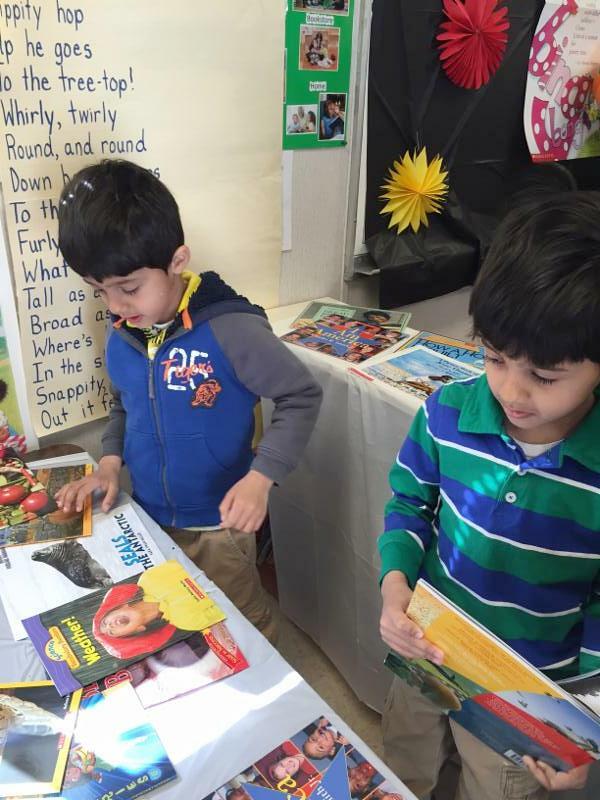 Some children from this Fairfax County school had no trouble making a choice, but others circled the tables weighing the awesome possibilities before settling on one book. Most of the children were excited to write thank you notes to RIF! Celebrating 50 years of inspiring children to read! Nearly half a century ago, Reading is Fundamental founder Margaret McNamara changed the face of childhood literacy with a simple yet innovative idea -- deliver new, free books to children who might not otherwise have any to call their own. 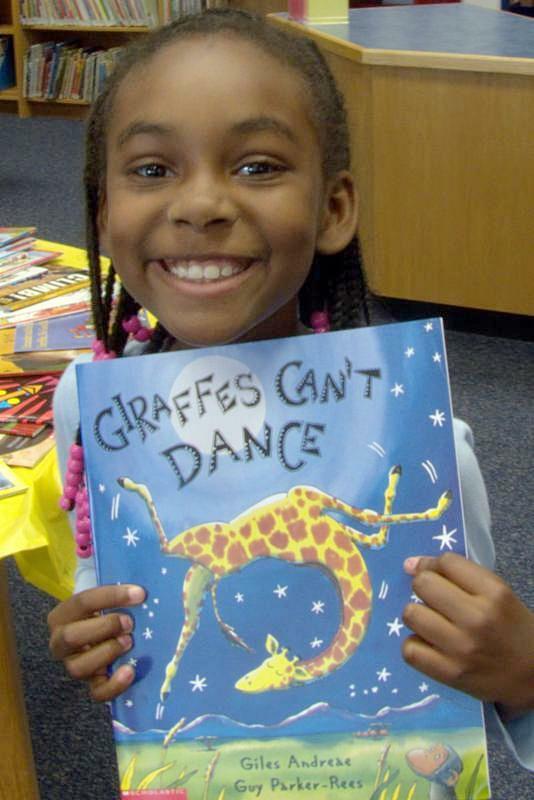 To date, RIF has given away more than 412 million books to more than 40 million kids in need across the country. Happy 50th anniversary, national RIF! 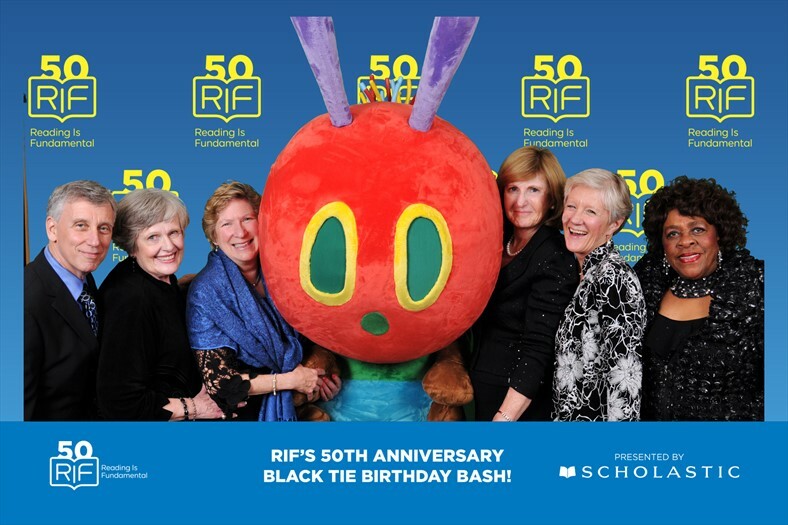 Reading is Fundamental, Inc. celebrated its 50th with a "Black Tie Birthday Bash" on May 5. 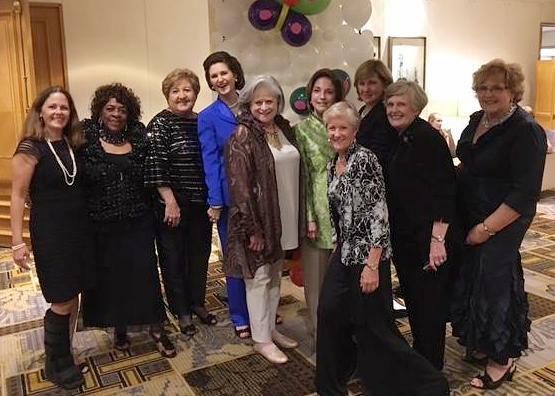 Pictured here (l-r): RIF of NOVA board members Justina Johnson Head, Hazeline Harris, and Paula Powell, founding member of RIF Lynda Johnson Robb, national RIF President and Executive Director Carol Rasco, and RIF of NOVA board members Sheila Jonas, Lisa Keathley, Mia Mason, Nancy King, and Chris McLaughlin. RIF of NOVA board members were guests of Books4School, a Birthday Bash sponsor. From left, Books4School president Marty Fields, RIF of NOVA co-president Nancy King, Books4School vice president Amy Fields, the Hungry Caterpillar, and RIF of NOVA board members Mia Mason, Lisa Keathley, and Hazeline Harris. The highlight of the evening was Lynda Johnson Robb's reading of Emily Winfield Martin's book, The Wonderful Things You Will Be. Please share the RAP! Forward our newsletter to your friends and anyone interested in providing books to underserved children! Subscribe here!